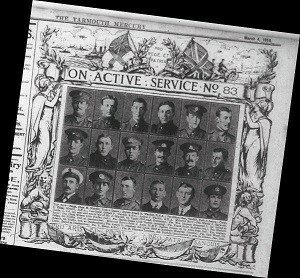 Men on active military service from Great Yarmouth had their pictures displayed each week in the Yarmouth Mercury. Over 700,000 British soldiers perished in the four horrific years of WW1. The people of Great Yarmouth were not spared. The town’s war memorial shockingly reveals the sacrifice of one Great Yarmouth family. The Durrant family lived at 4 Kent Square. Thomas Durrant and his wife Amelia had four sons. All would enlist; only two would return. Arthur Thomas Durrant, aged 21, had just married when war broke out. He left his job to enlist in the Royal Irish Rifles. He was injured twice, first in France and later in Egypt. He returned to Great Yarmouth in 1918. His younger brother, Victor, was 19 when he joined the Essex Regiment in 1916. He too survived the war and returned to Great Yarmouth. The two remaining brothers, however, were less fortunate. Leonard Frank was also 19 when he enlisted in the Leicestershire Regiment. In 1916 he suffered from shellshock, and after being hospitalised, returned to the trenches. He was captured and transferred to a prisoner of war camp in Germany. Here he died in captivity in October 1918. Only weeks before the war’s end. Sidney Cecil was only 17 when joining the Norfolk Rifles. He was injured fighting in Italy but returned to active duty in Flanders within weeks. He died aged only 21 and is buried at Tannay British Military Cemetery. Who can imagine the anguish felt by Thomas and Amelia Durrant at seeing the devastating effect of four years of war on their family?